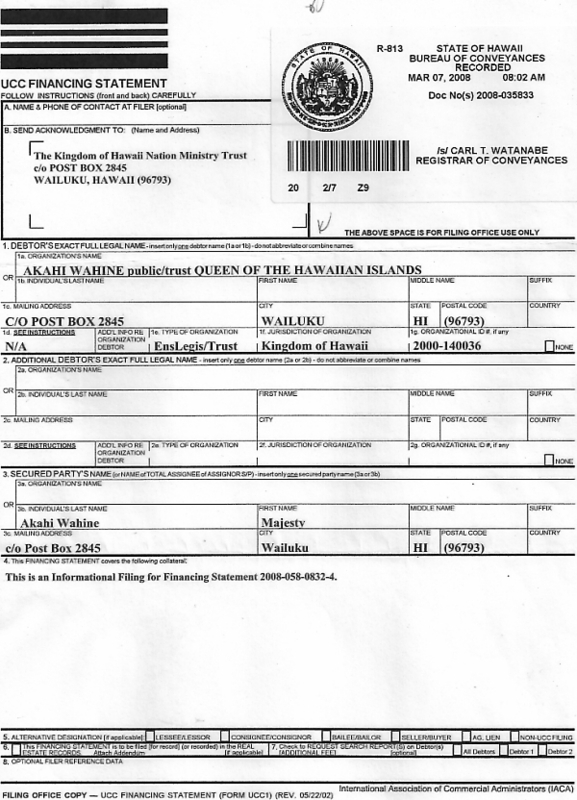 His Royal Majesty King Akahi Nui and Akahi Wahine, by the grace of God, King and Queen of the Hawaiian Islands, DID give notice that the Collateral consisting of the KINGDOM OF HAWAI I MOKU'ANPUNI FLAG is herein registered in the Commercial Chamber under necessity, as public and private Notice to the World at Large; States, Nations and the International Community and Non-Governmental Organizations (NGO) and the above property; Sovereign Flag of the Sovereign Kingdom of Hawai i Nation is hereby registered in the same and liened at a sum certain $500,000.00 (Five Hundred Thousand) USD or money of account/credit, and said Flag being recorded, under necessity, at the STATE OF HAWAII BUREAU OF CONVEYANCES on December 6, 1996 via reference Doc No. 96-172964. 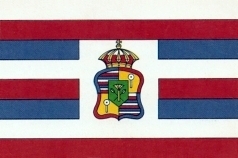 Said Sovereign Flag described as follows; Each Stripe represents eight Islands in the Moku'aupuni O Hawai'i with the Royal Coat of Arms in the Center of the Kahae. National Standard 3 feet by 5 feet in size, with each stripe 4 1/4 inches in height and 5 feet in length. 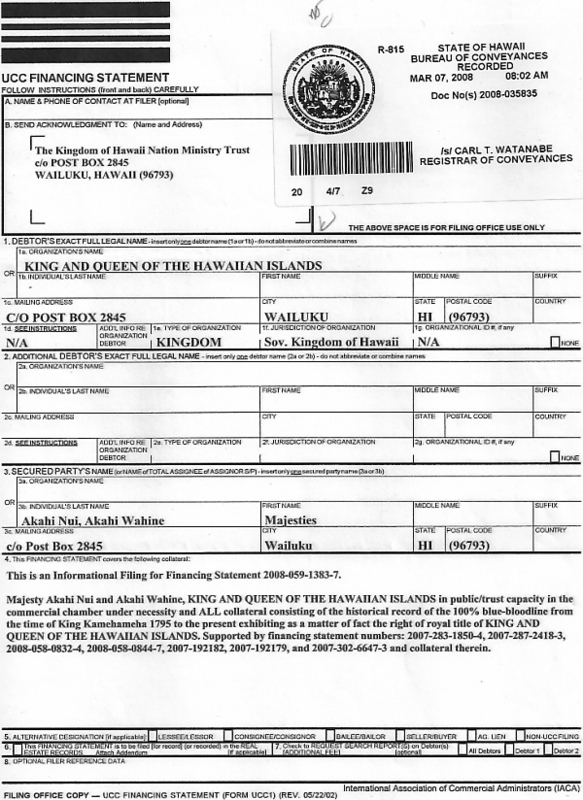 Within the first white stripe, centered is the lettering that appears; "Kingdom of Hawai'i" in 2 1/2 inches in Gold Lettering. 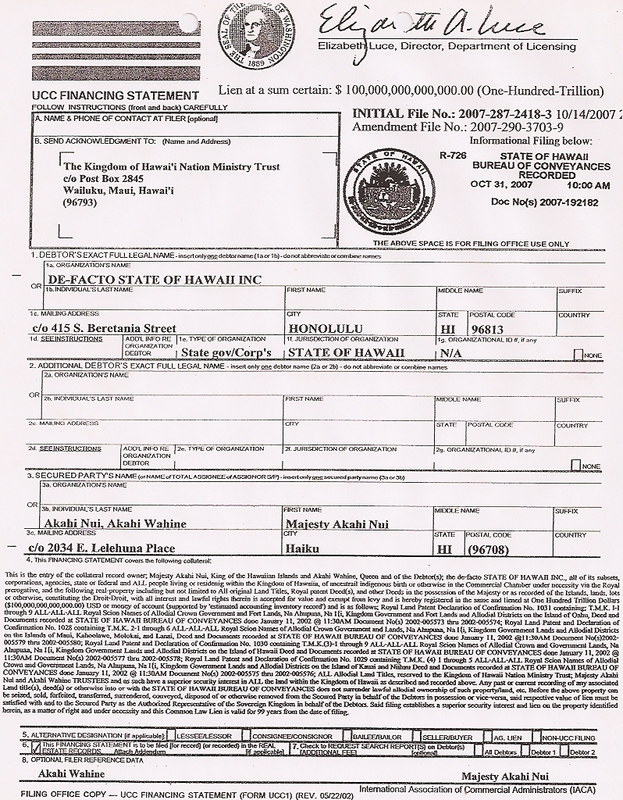 Within the last eighth red stripe, centered appears the lettering "Moku'aupuni" in 2 1/2 inch Gold Letters. 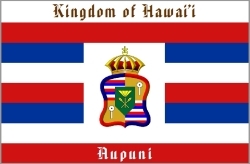 Said Sovereign Flag signifies and designates as flown on the Hawaiian Islands including but not limited to Maui and the Hawaiian Palace of the law and the jurisdiction of said Sovereign Kingdom of Hawai i for all contracts, commerce, authority or otherwise and wherever attached, displayed or flown signifies Kingdom property and or allegiance thereto. 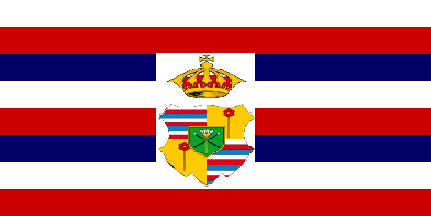 Said Sovereign Flag herein described is herein COPYRIGHTED, unless authorized by the Kingdom, pursuant to Hawaiian common law and by Royal prerogative, under necessity and as a matter of Right. 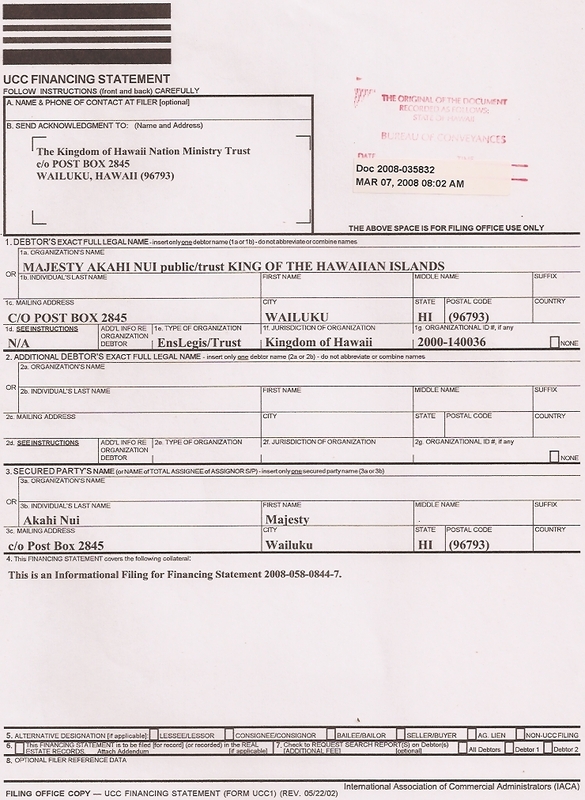 ALL collateral consisting of the historical record of 100 percent blue-bloodline from the time of King Kamehameha 1795 to the present exhibiting as a matter of fact the right of Royal Title of KING OF THE HAWAIIAN ISLANDS, supported by financing statement No. 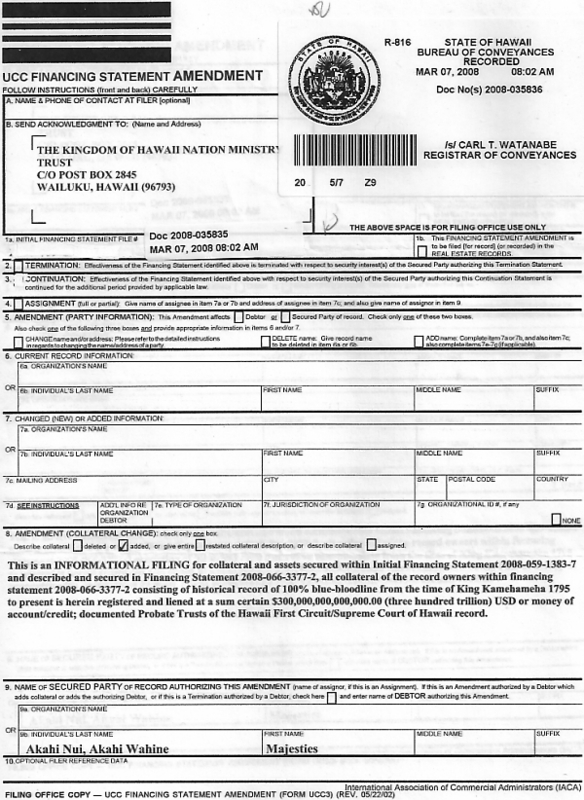 's 2008-035835 (STATE OF HAWAII BUREAU OF CONVEYANCES) and the following: 2007-283-1850-4, 2007-287-2418-3, 2008-058-0832-4, 2008-058-0844-7, 2007-192182, 2007-192179 and 2007-302-6647-3 and all collateral therein. 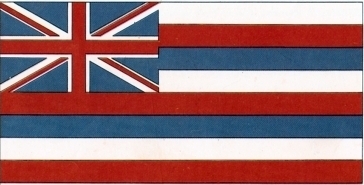 King Kamemnameha I, who succeeded in uniting the Hawaiian islands into a single kingdom, received a British Union Jack from the explorer, Captain George Vancouver, in 1793. 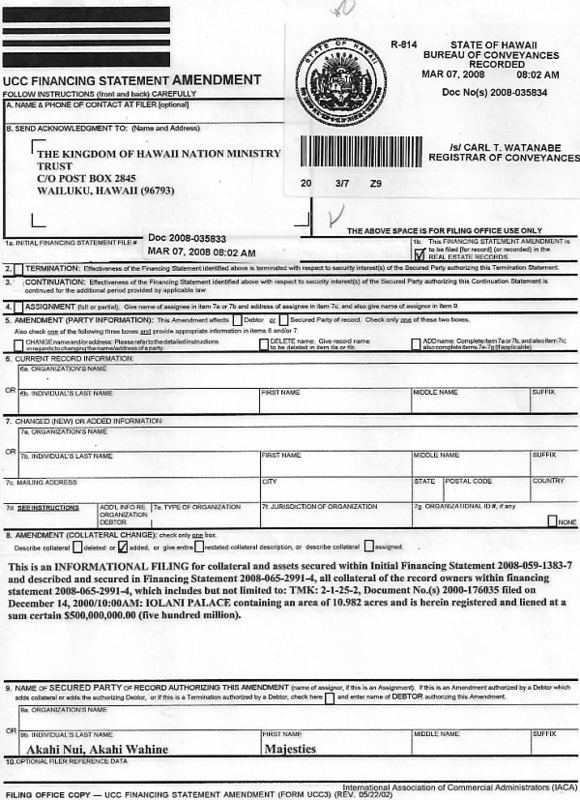 On 25 February of the following year the accepted and informal British pretectorate over his islands and, although this act was never ratified by the British government.